Nothing makes me happier than coming out of a great weekend and this one was one of those! We had a couple of birthdays to celebrate within our circle of friends so we headed to Galveston, a nearby island. 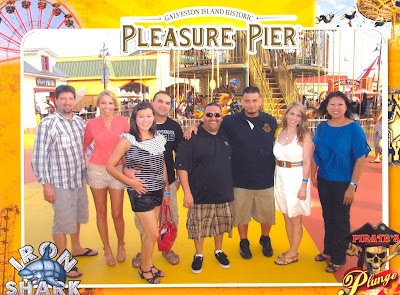 A new pier opened there so what better way to celebrate than with games, amusement rides, great friends and souvenir photos! Did you all get out and about this weekend? Do fill me in! Sounds like a fun day! We have a Bubba Gump in Times Square, but I've yet to try it out. Is it good eats? It is good Dorkys. Very touristy though so it is a little more pricey than it is really worth. I love the "instant postcard"!! It does look like a fun place!